NMM 10141. 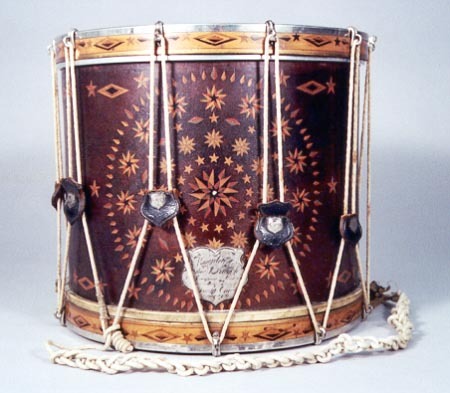 Side drum by W. S. Tompkins, Yonkers, New York, 1860. Handwritten inside shell: Wm S. Tompkins / Maker / Yonkers NY / July 31 1860 / No 2190. William F. Ludwig II Collection, 2002. Engraved on a silver-plated shield: Presented to / Tm. J. Hellrigle / by S. Cieighead D. Iddings / And others of the City of / Dayton Ohio / August 20. 1860. 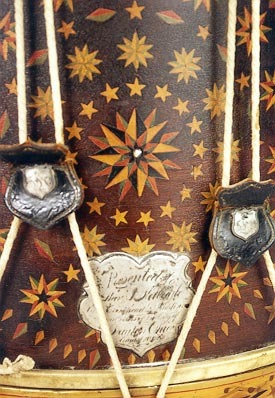 Ornately inlaid mahogany shell featuring a field of stars in concentric circles around a large central star. Ten leather tugs cut in the shape of shields, each with the initials T. J. H. engraved on a small silver-plated shield on the tug.